The Nokia N97 is arguably Nokia's most powerful handset to date, and it combines a large touch-sensitive display with a QWERTY keyboard, 3.5G high-speed data, a 5 megapixel camera plus GPS and mapping support. 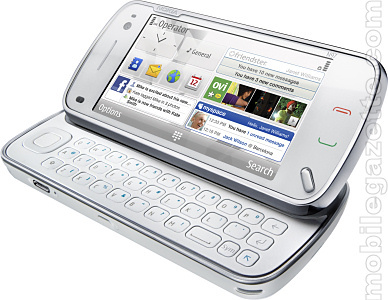 Clearly, the N97 incorporates several elements from the Nokia 5800 XpressMusic. 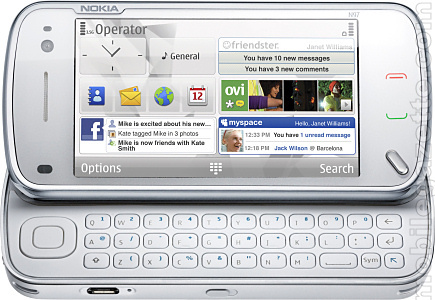 But the N97 is more than just a 5800 with a slide-out QWERTY keyboard. It also steps into the territory of the Nokia E90 and Nokia N810 series of devices, and it competes effectively with the Nokia N96 in most respects. 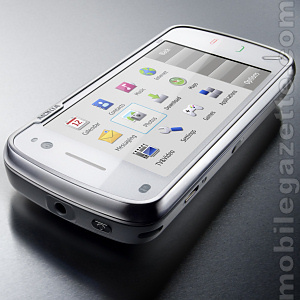 However, all these alternative models have different strengths and weaknesses compared with the N97. So, what exactly do you get with the Nokia N97? The large touchscreen display is an obvious place to start - the 640 x 360 pixel display is the same resolution as the 5800, but the N97's panel is larger at 3.5". As with the 5800, this is a touch-sensitive widescreen unit, Nokia call this resolution "nHD" which we guess is "near HD". It's almost the same as the VGA resolution that we have seen in some rival devices, but the E90 manages a 4" 800 x 352 non-touch screen, and the N810 is 800 x 400 pixels and 4.1". Crucially though, the N97's display does look to be better than the arch-rival Apple iPhone 3G. The N97 also lacks the TV tuner from the N96, and there's no mention of an FM radio either. The slide-out QWERTY keyboard seems to have good spacing between the keys, the slider mechanism now angles the screen and keyboard slightly to make the N97 easier to use. One notable thing is that the key alignment is different from the E90 and N810 (which had Q, A and Z all in a column), the N97's arrangement is similar to that used by HTC with a Shift key directly underneath A instead). The camera is pretty much as good as you will get with a Nokia - it's a five megapixel unit with autofocus and dual-LED flash and a Carl Zeiss Tessar lens. Video capture resolution is 640 x 480 pixels at 30 frames per second. Recorded video clips can be played back using the N97's TV-out port. Ovi integration means that photos can be uploaded as soon as you take them. Nokia don't mention if the N97 has geotagging, but we think guess it almost definitely does. The Nokia N97 has A-GPS built in, and usefully it comes with a digital compass. This can be used with the Nokia Maps application or one of Nokia's city guides. It should also be possible to use Google Maps instead, if you prefer. Of course, some of these mapping applications will cost extra. In addition, the Nokia Maps application has had a major upgrade, making it as good as (or better) than a dedicated satellite navigation system in many respects. The new version of Maps synchronises with a PC and comes with a satellite view, 3D view of major landmarks, camera alerts, traffic information and integration into Nokia's Ovi service. Music playback supports MP3, WMA and AAC variants, plus there is MPEG4, WMV and Flash video playback at up to 30 frames per second. Audio output is via a standard 3.5mm socket, which is an improvement over many previous devices. Nokia have improved the operating system again, to give easy one-touch access to favourite services, and of course there's a web browser (with Flash support) that takes full advantage of the large screen, an email client and an RSS reader. As you would expect from Nokia, this is a Symbian S60 5th Edition device which comes with all the usual features. At 150 grams, the Nokia N97 is fairly heavy (but much lighter than the E90). The large 1500 mAh battery gives up to 5 hours talktime and 16 days standby time on 3G, 4.5 hours of video playback or 37 hours of music playback. The Nokia N97 measures 117 x 55 x 16mm (although it is a little thicker where the camera is). Internal memory is an impressive 32GB, and this can be expanded by a further 16GB using a microSD card. It is nice to see that Nokia have given the phone both an impressive amount of internal memory and a card slot. Underneath it all, this is a quad-band GSM phone with tri-band HSDPA support plus 802.11 b and g WiFi. This should mean that the N97 will be able to get a high-speed data connection pretty much anywhere you go. The N97 also comes with stereo Bluetooth and USB 2.0 connectivity. Nokia say that the N97 should be available during the first half of 2009 for around €550 before tax and subsidy, in what appear to be white and black colour schemes. This price the N97 quite an expensive phone compared to the 5800 XpressMusic (which is half the price), but contract customers can expect a big subsidy in any case. Since the N97 is almost viable as a laptop replacement, then the cost isn't so bad. It isn't quite a replacement for the Nokia E90 though - we think that Nokia will announce a new Communicator class device in February, but it will be closely based on the N97. We are definitely looking forward to this one when it comes out - it's only a shame that we have had to wait so long for a touchscreen Nokia with a QWERTY keyboard!